Have you ever enjoyed Diamond Roulette before? If yes, you must be excited and cannot wait to see it again. If you missed the event last time, hopefully this one will bring you an unforgettable exciting experience in LoA! Diamond Roulette usually comes once or twice a year! Enjoy it and good luck, everybody! Description: Player above Level 45 have 1 free attempt daily, and VIP 4+ player can gain 1 more free attempt daily. Every 1000 diamonds recharged or every 3000 diamonds spent will win you an attempt to draw for rewards in Diamond Roulette. Besides, each player will win an extra free attempt when all players in all servers win 15,000,000 diamonds from this Roulette. Come on to get huge rewards as much as possible! 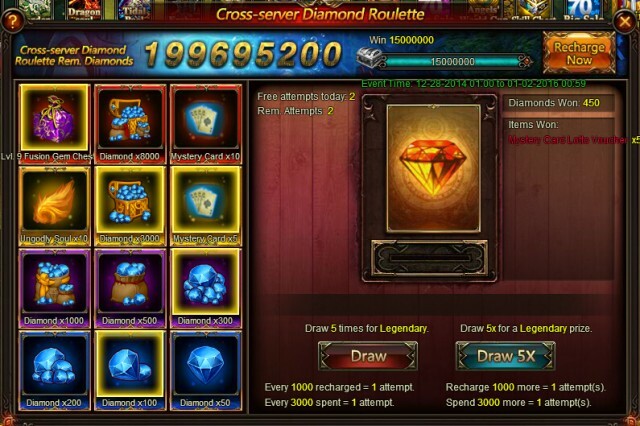 In this Roulette, you have 100% chance to gain rewards, such as different amount of diamonds, high level Fusion Gem Chest, Ungodly Soul, and Mystery Card Lotto Vouchers.